Great victory in the Basque Country! 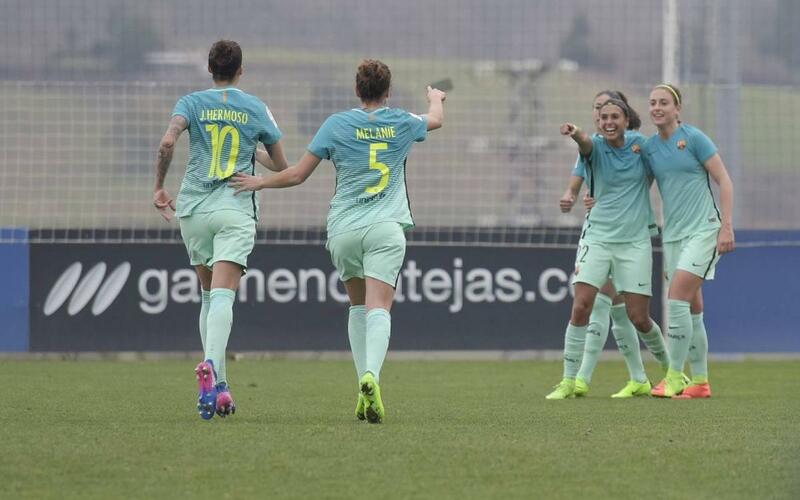 The Barça women’s team were in San Sebastian for the first league game after the break and in search of win to put serious pressure on leaders Atlético Madrid. And that’s just what they got from a pulsating display. Wearing green, Barça took 22 minutes to really start testing Real Sociedad when Jennifer Hermoso’s strike was turned onto the crossbar. Vicky Losada, Alexia and Andressa also had chances before the goal finally came from Jennifer Hermoso, back from injury, who scored an absolute cracker in the 41st minute as she weaved her way into position and delivered the killer blow. Sandra Paños, also back from injury, made some fine saves to keep that lead alive through half-time, after which a flurry of yellow cards was followed by Andressa Alves making it two, the Brazilian showing immense skill before slotting the ball into an empty net. Barça allowed their dominance to slip a little given the comfortable lead, but some fine defending kept things as they were until the dying minutes, when a fine run by Koko was followed by a tap-in by Olga Garcia and Xavi Llorens and his team could start celebrating a fine win on the Basque coast.